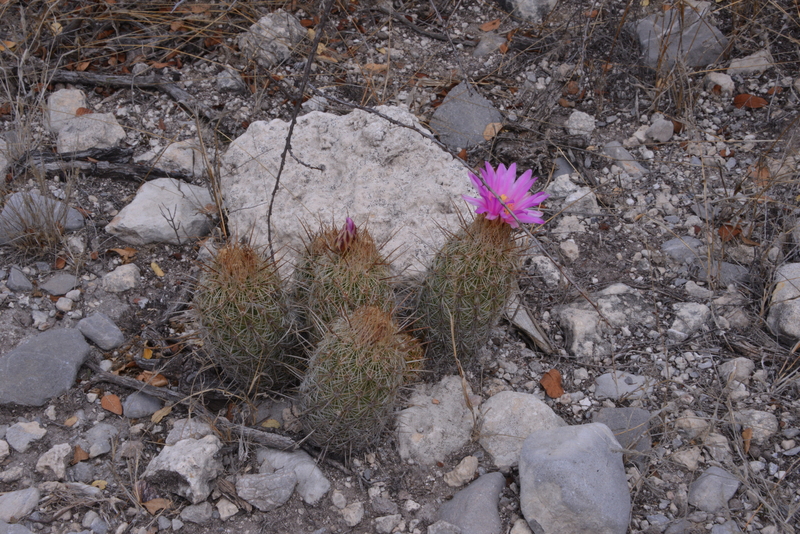 Today was the last full day’s cactus hunting, we went back towards Bellavista, where we went the first full day to see the southernmost Thelo – T. hastifer. They were in bud then. First I had some stops marked for Ariocarpus kotschoubeyanus ‘elephantidens‘ and at the first (S3133) it turned out that we had stopped here on that first day to let Ian take some pictures of Yuccas that he liked the look off. Cliff and I didn’t even get out of the car. Today, we ignored Yuccas and put our noses to the ground, to find thousands of Arios! Our next stop, again for ‘Kots’, turned out to be just 1.3 km away, so we kept that for the way back. On to a stop first reported 10+ years ago for Turbinicarpus pseudomacrochele. (S3134) We’ve not had much luck for Turbs ‘proper’ and despite the three of us spread over a hill side for some 90 minutes in the blazing heat, we found none. 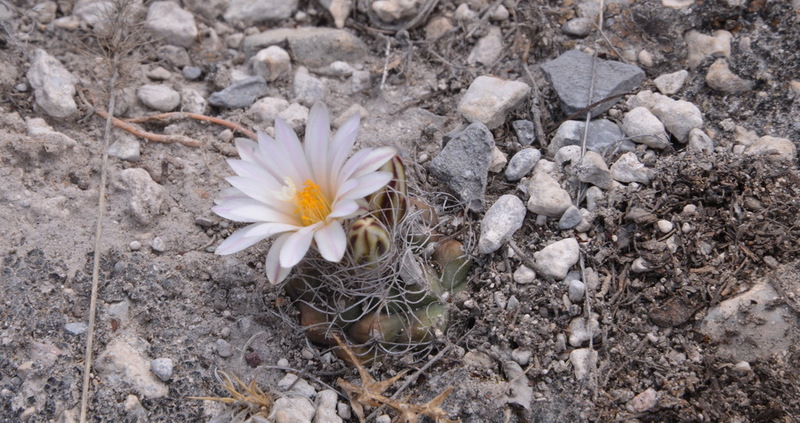 Cliff was back first to the car – to find the only turb, in flower, right next to the car. 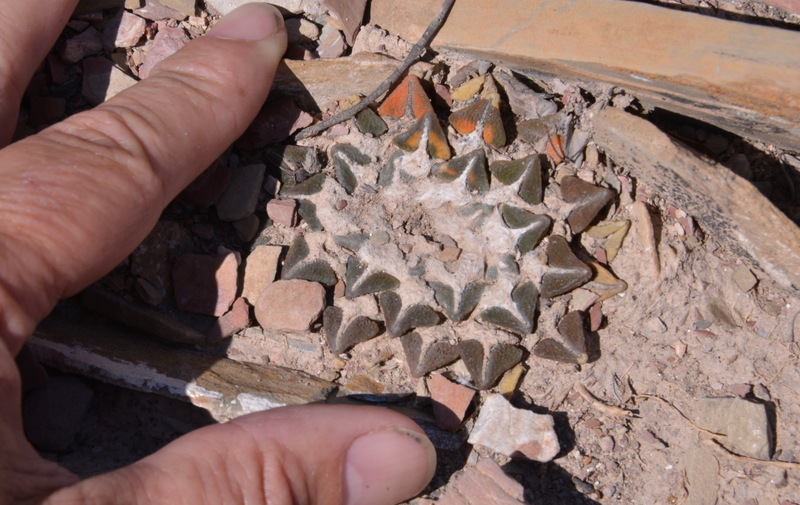 We all photographed it from every different angle and moved stones around to make it look like a different plant, but we all know it was just the one. Typical. Flower colour? You guessed it. Much to our surprise, T. hastifer was also here – I thought that it came from just one location, and here it was also in flower, so no need to go back to our original site – quite a long walk from car park to plants. And back to the Ariostop that we had given a miss (S3135) on the way up. 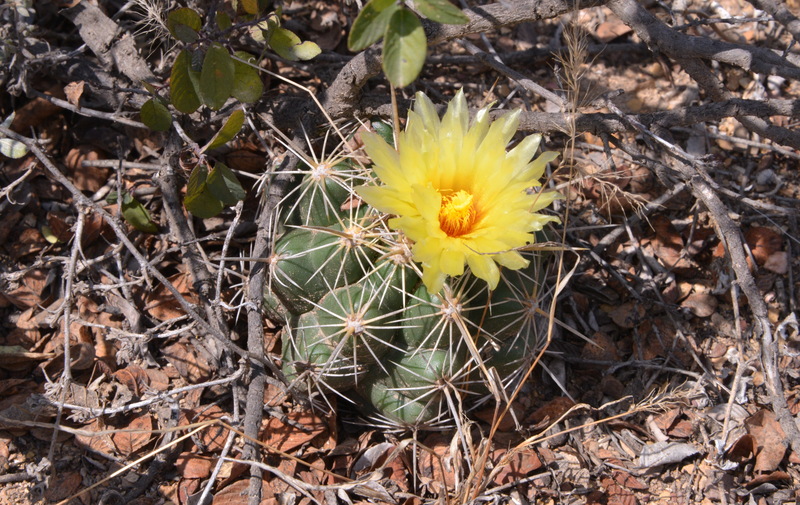 We were distracted by hundreds of Thelocactus leucacanthus, with yellow flowers, as the main ssp should have. Tomorrow is just a 240 km drive to the airport & hotel (just a bit more than Pichidangui – Santiago. Next morning I catch my flight early (take a taxi) while Cliff & Ian have to hang around until early evening – they arrive Thursday around 16:00 hrs, when we should be doing battle with Brussels’ traffic.